If you’re like any other millennial sharing a single Netflix account with all your friends and family, then you’ve probably seen “Black Mirror”’s new interactive movie, “Bandersnatch.” If you haven’t, just know that it involves you, the user, making “life-changing” decisions for Stefan, the protagonist of the film. In light of this self-proclaimed “revolutionary” film, I decided to become an Instagram baddie and have my followers run my life. 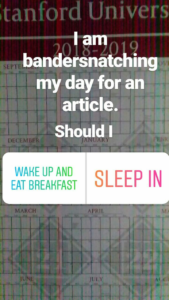 So like the good egg that I am, I made a bunch of Instagram polls for the “life-changing decisions” I come across on a daily basis. To be fair, I was already awake. Still, that wasn’t going to stop me from promoting democracy abroad to all my followers. This first poll slapped me in the face, spit on me and told me to wake up and eat the most important meal of the day. In an election upset that shook my stomach to the core, my Instagram followers who voted early told me to eat my fruit first. 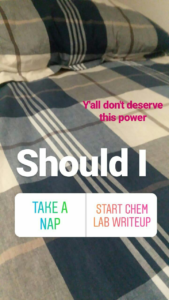 I decided early on to wait ONLY five minutes for the Instagram poll to play out. Once five minutes passed, I lost my patience and decided to no longer watch my plate meticulously in Stern Hall. 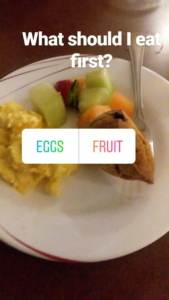 Interestingly enough, after eating my fruits first and then eating eggs, the tide shifted. As the day would progress, so would the pro-egg-first movement. My next poll decided the state of my mental health. It was with this poll that I learned that choice is an illusion. As someone who has walked most of his Stanford career, I have grown indifferent towards taking long walks to my CHEM 31B lecture. I desired the people’s vote for the only true incomparable choice. I prayed for them to make me walk and frolic at the clouds. Instead, they played me and pushed me onto the Circle of Death. 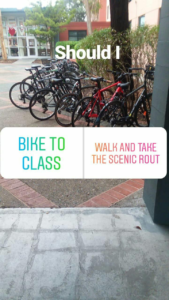 They inflicted on me the anxiety of biking to class in five minutes. And then, once again, the tide shifted. Sadly, it was too late and the people’s vote fell to the electoral college. In a poll that pit friend versus friend, the people were divided. 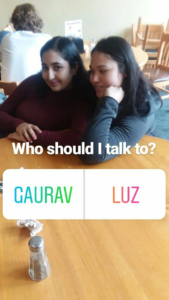 In the end, Luz won but the hesitance my followers expressed on my poll suggested to me that people didn’t want to hurt either of the girls’ feelings. I always take a nap at least once a day, so you can imagine my happiness when the poll initially granted me my victory. Later in the night, when I checked this poll, it seemed that the responsible people won, and if I’m being honest, I probably should have started my chem lab write-up earlier than I did. People made me get up. How rude. But I was able to eat an entire stem of grapes and good batch of cookies, so it was not the end of the world. This poll, however, was another one of those swing votes politicians like to obsess over. 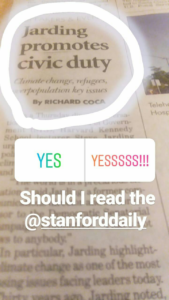 Should I read the @stanforddaily Yes / Yes!!! I had to plug the Daily, obviously. The final poll of the night gave me so much insight into my followers. If I am being honest, I was going to go out regardless of the poll. What struck me most was going through the list of who voted “No.” As I scrolled down the list, I found some of the usual suspects — my RAs, for one. But then, I saw individuals who also frequently party vote “No.” Long story short, I probably could have stayed in and been a good egg, but on that day, I blamed all bad decisions on my Instagram followers. Contact Richard Coca at richcoca ‘at’ stanford.edu. A dark horse and a work horse, Richard strives towards bettering himself and helping others on the way. He understands that perfection is a process, and one that isn't necessarily easy. He currently plans to major in biology and maybe minor in Twitter. Contact him at richcoca 'at' stanford.edu.